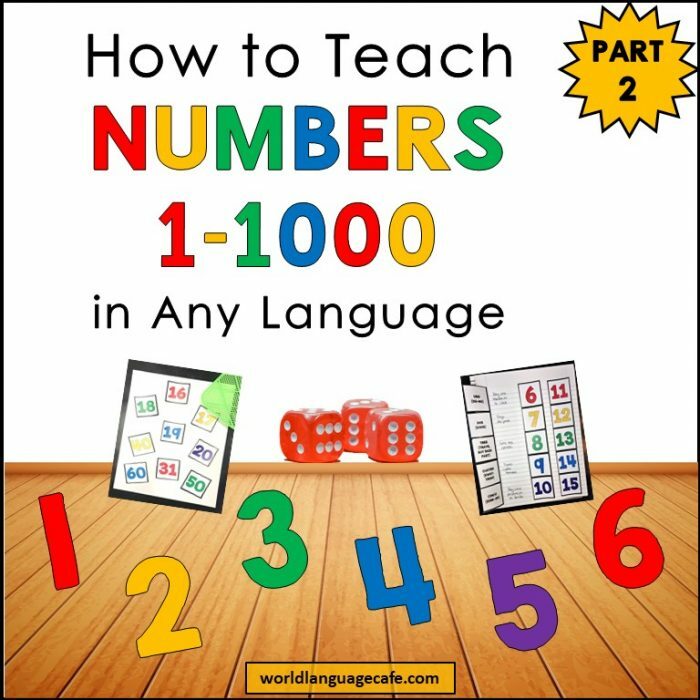 In Part 1 of teaching French, Spanish numbers 1-1000, we discussed how to teach numbers 1-12. Today we’ll be focusing on numbers 13-1000. Teach numbers 13-20 using similar techniques from the last post. Repetition, gestures, whole body movements, playing with dice, etc. 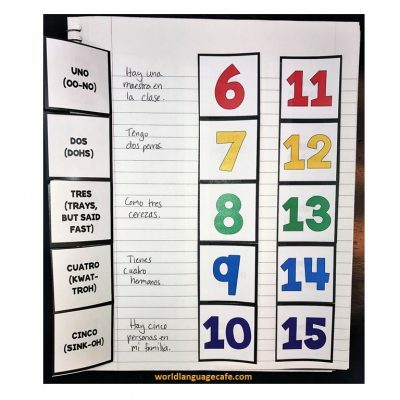 Another good idea is have students count while taking steps across the room. 1. Count with counting sheets. Younger students put a marker on each square as they count it. Older students just use their finger. When they get stuck, they look up how to say the next number and then start over again. They repeat this until they can do them all. 2. Teach students how to say, “minus, multiplied by, divided by”. Have the students take turns reading the numbers. The winner has to repeat back all the numbers. 4. Ask questions about numbers of items. How many girls are there in class? How many boys? How many red books? 5. After you have done many oral activities, add some writing. 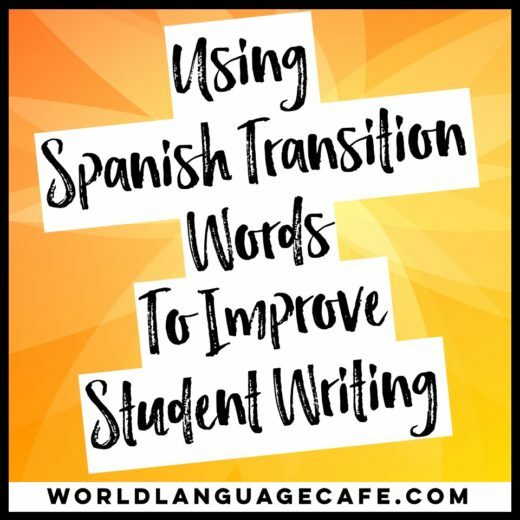 I use these interactive notebook flashcards (French, Spanish) and have my students practice writing underneath the flaps. They write the number 3 times or write a simple sentence using the number. Model a few sentences for them. Ex. How much does the book cost? It costs 3 euros. Ex. How many dogs does Joe have? He has 4 dogs. Ex. There are 20 desks in class. 6. Introduce numbers 30, 40, 50, 60, 70, 80, 90, 100. Then teach 31, 32, 33 etc. ; 101, 102, 103, etc. ; 200, 300, 400, etc. Use the same techniques as before. 7. Use flashcards to play games like flyswatter, vocab battle, hands up, etc. Get instructions for these games in 50 Games to Spice Up Your Class in my Free Resource Library. After you sign up, check your email for the password and access link. 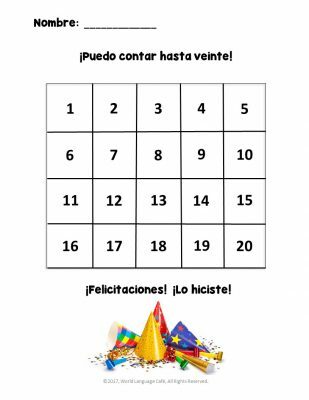 You can also use the INB flashcards (French, Spanish) to make these game cards. 8. Host a small market in your class. Students bring in 2-3 random objects from home to pretend to sell in class (the more random the better, but nothing fragile or valuable). 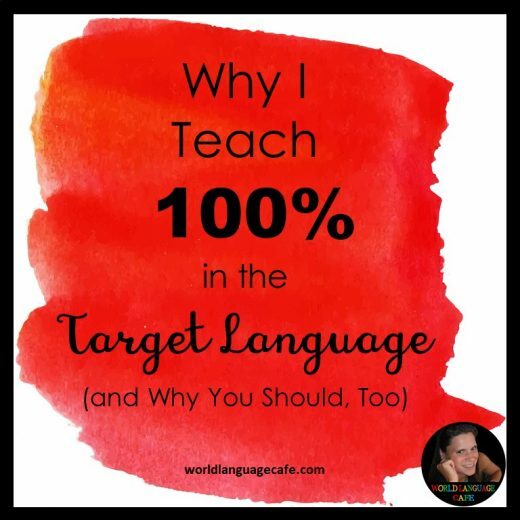 For homework, they label their objects in the target language. In class have them put prices in euros or whatever other currency you’d like to use on their objects. 1/2 the students are vendors and 1/2 the students are customers. 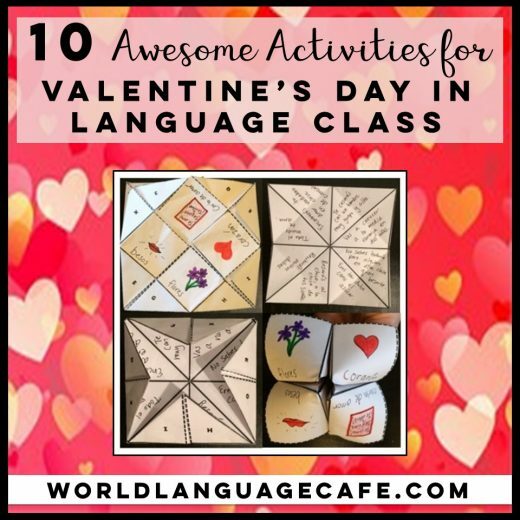 Hand out euro manipulatives or whatever other money you choose to use. Students walk around class and ask how much things cost. Vendor: Hello. Welcome (to my store). It costs ____ euros. Thanks (for coming to my store). Customer: Hello. How much does ______ cost? Thank you. 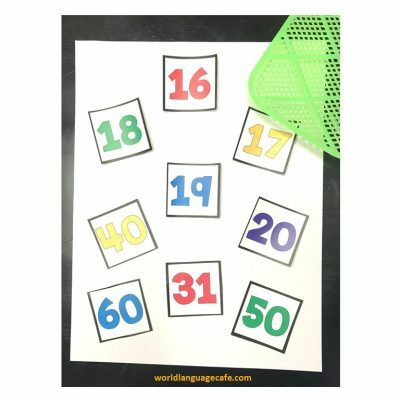 Hope this “Teaching Numbers” post has been helpful. Would love to hear what you do in your classroom. Leave a note in the comments section. Remember to get your 50 games and activities, number reading sheet, and many other goodies by signing up below.